This book sounds like Parent Trap meets modern day YA. I love it! Lauren Morrill entertained me with her debut novel, Meant to Be, so I have a feeling she'll do the same with this one as well. What a fun idea for a story! P.S. I adore her covers, so so much! I know I'm in the minority in this one, but I wasn't the biggest fan of Meant To Be. I absolutely loved the concept but felt that the execution left a little something to be desired. I particularly hated the nickname 'Book Licker' - It just set my teeth on edge for whatever reason. Anyway, I will say that Morrill consistently comes up with concepts that I desperately want to read in theory, and this one is no exception. As you said, it reminds me a little of The Parent Trap, which I absolutely loved growing up. Plus, one of the love interests is a hockey player! As a Canadian I'm genetically programmed to find that attractive ;) I'll likely take a chance on this one despite my less than impressive history with Morrill's work. Great choice, Ginger! Meant to Be was so cute! And I think this one sounds adorable as well. She does have wonderful covers! ACK! I'm so excited about this one too! Super cute covers and fun stories are what I'm coming to expect from this gal. I love her covers, too!! I also love there is a female hockey player -- not something you see very often in YA! I didn't really enjoy Meant To Be, but I still have this one on my tbr. I had this on my WoW a couple weeks ago. I'm super excited for Being Sloane Jacobs. 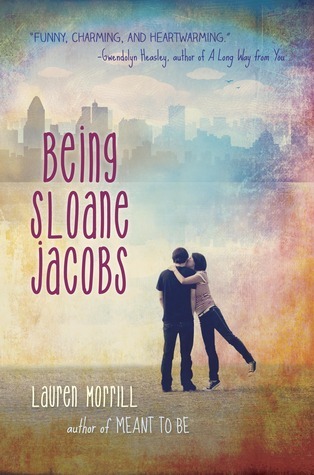 The cover is so pretty and Lauren writes some amazing lines that are just utter perfection.